An inconspicuous and well hidden facelift scar is very important as it allows patients the option of pulling their hair up without worry that a scar will be seen. 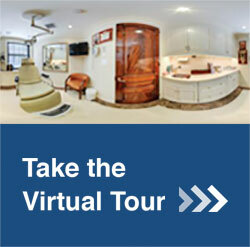 Additionally, scars are tailored for each patient's anatomy and variability in their hairline. Hair preservation is a large consideration in scar placement as well as following the natural creases around the ear and earlobe. Lifting in the proper direction and avoiding tension on scars prevents the pulled look after a facelift and allows for the best healing scar. Our doctor uses a double layered closure with placement of a deeper layer of stitching to avoid tension on the skin closure. Use of nonreactive sutures is also very important for the skin closure. Absorbable sutures are not used for the skin closure because as they absorb they could leave a red mark so Our doctor only uses absorbable sutures for the deeper closure and uses the non-reactive Prolene suture for the skin closure. It is important to hide the facelift scar inside the little cartilage in front of the ear called the tragus, also called a retro-tragal or post-tragal incision. 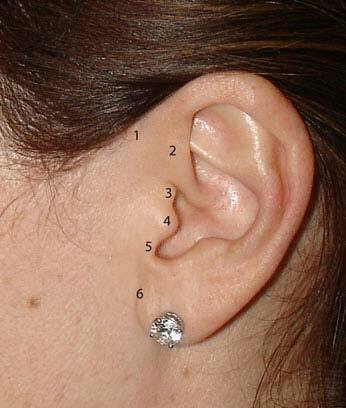 An incision in front of the tragus cartilage of the ear will be visible. Behind the ear, the incision is hidden in the natural crease and into the ear where the ear meets the hair. If the scar in the back comes out of the hairline it will be visible. Tip offs of a bad facelift are alterations in ear and hair anatomy and it is crucial to understand the importance of scar placement. Additionally, after the lift is performed and skin is excised the remaining skin over the tragus should be defatted and no tension should be placed on the tragus cartilage of the ear in order not to pull it forward. Our doctor uses a deep absorbable suture above and below the tragus to avoid any tension on the tragus. To obtain a natural scar, the earlobe anatomy needs to be preserved as well. If the curved portion of the earlobe attaches abnormally to the face, it will pull down with time and is called a "pixie" ear deformity and this elongated, attached earlobe is a tell-tale sign of a facelift. A perspective patient should hold their surgeon to the highest standards and ask to see pictures of his/her patient's scars around the ear. When making a facelift incision, Our doctor takes special attention to preserve the temporal hairline (above the ear in front) and hairline behind the ear. If these hairlines are distorted, it leaves patients with limitations regarding how they can wear their hair and patients will look pulled unnaturally. In front of the ear, the anatomical landmarks which Our doctor preserves is the helical root (gentle curve above the tragus) the tragal notch right above the tragus, the tragus (the piece of cartilage covered by thin skin often distorted or pulled with facelift surgery), the U-shaped notch below the tragus, and the earlobe (often pulled and stretched forward unnaturally (pixie ears). All these important landmarks create a natural result and Our doctor takes special attention to preserve and maintain the natural anatomy of these areas. Preserving these critical areas in facelift surgery takes time, surgical skill, and an artistic eye.